September 2017 – Assigned by the government of Niedersachsen, MMI provided a detailed analysis for restructuring the Medical University of Hannover (MHH). The analysis shows how large the surface area should be when restructuring MHH hospital for the period until 2030. The document contains specific area data, suggestions for structural changes and descriptions of new functional relations between the clinics as well as of workflows within and between departments. The analysis was submitted to the Ministry at the end of June 2017 after starting the evaluation of the current operational situation in January 2017. MMI´s team analyzed the hospital data pool in order to gain information about relations between the departments and travel pathways of patients and staff. Based on this analysis, a significant number of departments could be moved merged into thematic centers, where the same resources can be shared to make clinical workflows more efficient. Considering the growth projection of each department, MMI calculated the surface area, which is required to cover the demand until 2030. Finally, the expert team developed various suggestions together with an architect to show which new building structures could be realized within the existing hospital area. 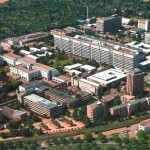 The government of Niedersachsen approved €1 billion for restructuring and rebuilding the MHH University Hospital. It is now being examined, which version of MMIs suggestions will be realized in the near future.